Traditional grits—in their pure form—come from corn, not from wheat, barley or rye (the three gluten grains), and therefore are gluten-free and safe to eat on the gluten-free diet. In fact, many lists of foods that are allowed on the gluten-free diet include grits. At least one popular brand of grits isn't actually safe for someone who has celiac disease or non-celiac gluten sensitivity. Fortunately, the gluten-free community has multiple different choices of truly gluten-free grits. Arrowhead Mills. This grain products manufacturer, a division of Hain Celestial, makes boxed yellow corn grits prominently labeled "gluten-free." Arrowhead Mills meets the U.S. gluten-free standard of fewer than 20 parts per million trace gluten (learn why gluten parts per million numbers matter). Bob's Red Mill. Another well-known producer of various grain products, including many labeled "gluten-free," Bob's Red Mill makes several different types of grits. Only one is labeled gluten-free: Bob's corn grits. Steer clear of barley grits (for obvious reasons), organic polenta corn grits, white corn grits, soy grits and millet grits. If you're sensitive to oats, be aware that Bob's processes its gluten-free products on the same equipment as its gluten-free oats (more on ​whether you should include oats in your gluten-free diet). Medford Farms. These grits come in a tube that looks more like it would hold breakfast sausage than a corn product, and you find them in the refrigerator section. They also carry a prominent "gluten-free" designation, and have less than 20 parts per million of gluten in them. Palmetto Farms. These very traditional corn grits come in three varieties: stone-ground yellow, stone-ground white, and stone-ground mixed. The company says its traditional stone mill grinding method preserves the natural oils found in the germ of the corn. Palmetto Farms says it has tested its traditional grits (not its cheese varieties) and they tested below 5 parts per million, well below the "legal" gluten-free standard of 20 parts per million. Sam Mills. This Romania-based company, which bills itself as "The Corn Master," makes corn grits that are considered gluten-free (to less than 20 parts per million) and 100% GMO-free. Sam Mills grits can be found online and in some stores in the U.S.
Quaker grits (which come in a wide variety of flavors and packaging) are the most ubiquitous grits you'll find in U.S. supermarkets. But unfortunately, even though they have no gluten ingredients, Quaker does not consider them to be gluten-free due to the possibility of cross-contamination. Therefore, you should steer clear of Quaker grits—there are better choices out there. Cooking grits is easy (sort of like rice). It's likely your grits came with a recipe; if so, definitely use it. If you don't have a recipe, combine the grits in a large pot with four or five times as much water as grits (one cup grits to four or five cups of water). 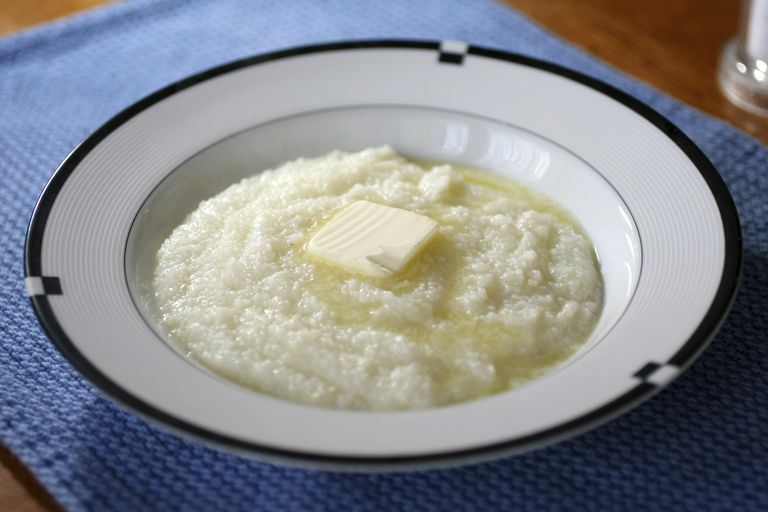 Use less water for thicker grits. Bring the mixture to a boil, and then turn down the heat and let it simmer for 45 minutes, stirring frequently to make sure the bottom doesn't burn. Add butter and salt to taste. In the South, grits often are served with ham, which is a great idea (just make sure to use ​gluten-free ham, since not all brands are safe). When grits aren't safe on the gluten-free diet, it's usually because they've been processed on equipment that also processes those aforementioned gluten grains. It makes financial sense for manufacturers to use shared equipment to process their various grain products, but it means the finished products may have too much gluten cross-contamination to be considered truly gluten-free. If you eat cross-contaminated grits, you might get glutened, even if the label on the grits doesn't reference anything but pure corn grits. Sometimes, grits are actually made from an unsafe grain, such as barley. It goes without saying that you should avoid these, but it means you can't just pick up any old package of grits and just assume they're safe. Always check the ingredients to make certain the package you're choosing is one you can have.